Lord Dhanvantari is considered to the heavenly Doctor and he is portrayed as Vishnu with four hands, holding restorative herbs in one hand and a pot containing energizing nectar called amrita in another. According the vedic puranas Dhanavantari appeared from the Sea of Milk and showed up with the pot of nectar amid the history of the Samudra even as the sea was being churned by the devas and asuras, with the Mandara mountain and the serpent Vasuki. 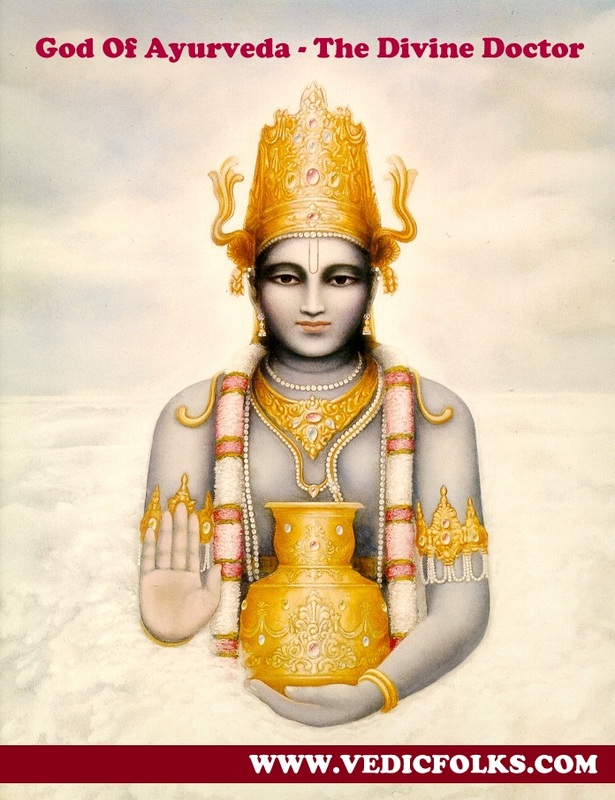 Dhanvantari is the incarnation of Lord Vishnu who rapidly cures the sicknesses of the ever-sick living beings just by his eminence represented, and simply because of him do the demigods accomplish long lives. Consequently the Personality of Godhead turns out to be ever celebrated. He additionally claimed an offer from the penances, and it is he just who initiated the medicinal science or the information/ knowledge of medication in the world. Prathana, Ganesha Puja, Doopam Deepam Neyvetyam, Karpoora Aarthi/Deeparathana, Mantra Pushpham for Ganesha, Sankalpa to Ejamanars/Sponsors, Yadhasthanam, Kalasa Avahanams, Archana for Avahana Devadas, Doopam Deepam Neyvetyam Deeparathana, Rudram, Chamakam, Purusa Suktham, Narayana Suktham, Durga Suktham, Sri Suktham, Bhakya Suktham, Shanthi Panchakam, Pavamana Suktham, Ayusha Suktham, Dhanvantari Puja (Moola mantra Japa), Agni Invocation, Ganesha Homam, Parivara Devada Homam, Dhanvantari Homam, Doopam Deepam Neyvetyam Deeparathana, Namaskaram, Maha Purna Huthi, Kalasa Deeparathana/Maha Deeparathana, Mantra Pushpam, Yadhasthanam, Kalasa Purochanam/Holy Water, Maha Prasadams, Final Namaskaram Process/Blessings from Bramanas. 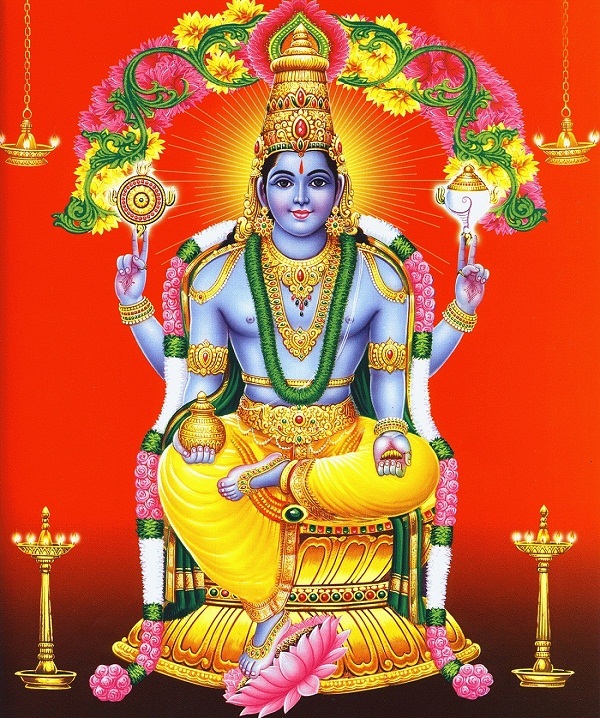 What is exactly done in Dhanvantari Homam? While performing dhanvantari homam (fire ritual) the 108 medicinal herbs which are believed to have a power of healing any kind of incurable diseases and other serious health problems are put in the homam kunda to the sacrificial fire. 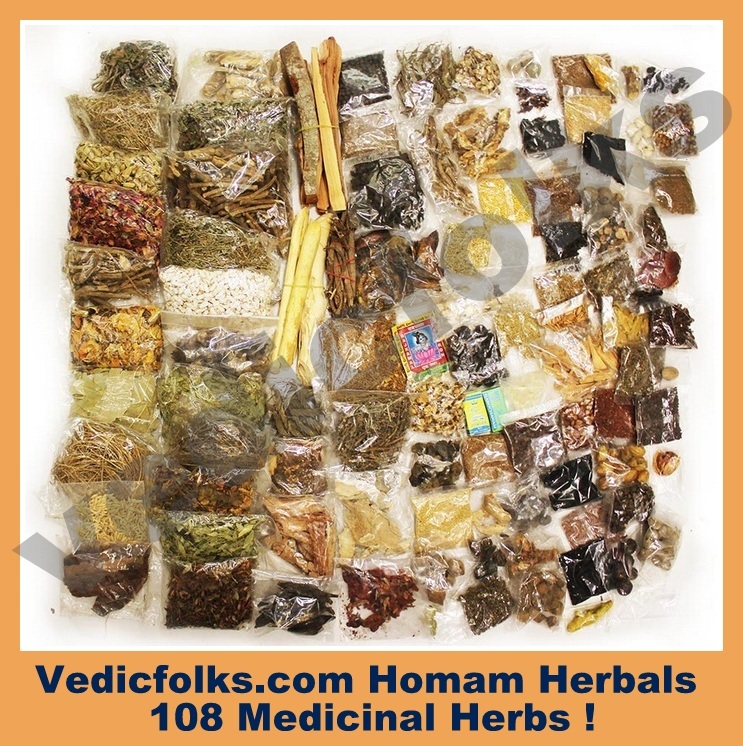 These 108 herbs used in homam/yagna makes the fire ritual very powerful and bring auspiciousness. - Lord Dhanvantari is the source of Ayurveda medicine, performing dhanvantari homam helps to cure incurable diseases and take away any prolong illness. 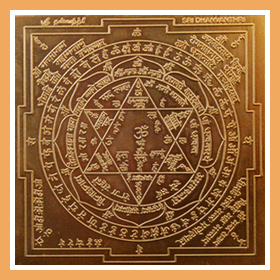 - Dhanvantari homam is very effective and is highly recommended for those people who are suffering from serious illness and there is no way of curing that illness. - As said in the Srimad Bhagavatham , by the grace of Lord Dhanvantari not only are diseases of the body and mind cured, but also the soul is relieved of the constant repetition of birth and death. 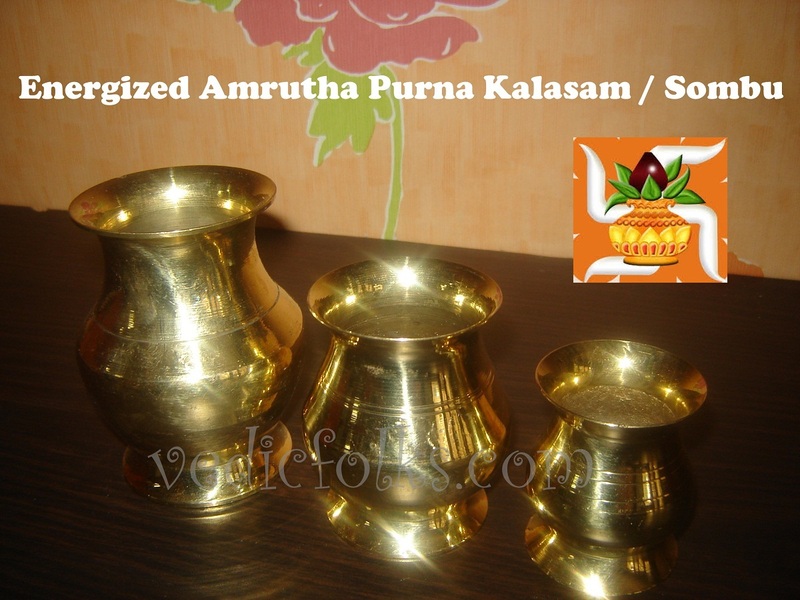 Energized Maha Amritha Purna Kalasam / Sombu - from Dhanvantari Homam: Keep this Amrit kalasam filled with water/theertham in puja area & do puja in daily basis to this energized Amrutha purna kalsam and have it for good health.